There is a truck driving around the woods outside of Yekaterinburg, carrying the sheet-wrapped bodies of eleven brutally murdered victims. The truck is heading toward the Koptyaki woods, where Yurovsky had earlier identified disused mineshafts that might work as a gravesite. But the truck breaks down. Another gang of men wait in the woods for them. Turns out there's only one shovel amongst them. Yurovsky dismissed the majority of the men. The victims were stripped--this is when the jewels sewn into underwear, corsets, hats and other items were discovered--disfigured, dumped into the mineshaft, and doused with sulphuric acid. Their clothing was burned. But Yurovsky realized the mineshaft wasn't deep enough. The men tried to grenade the mineshaft into collapsing, but it still wasn't good enough. 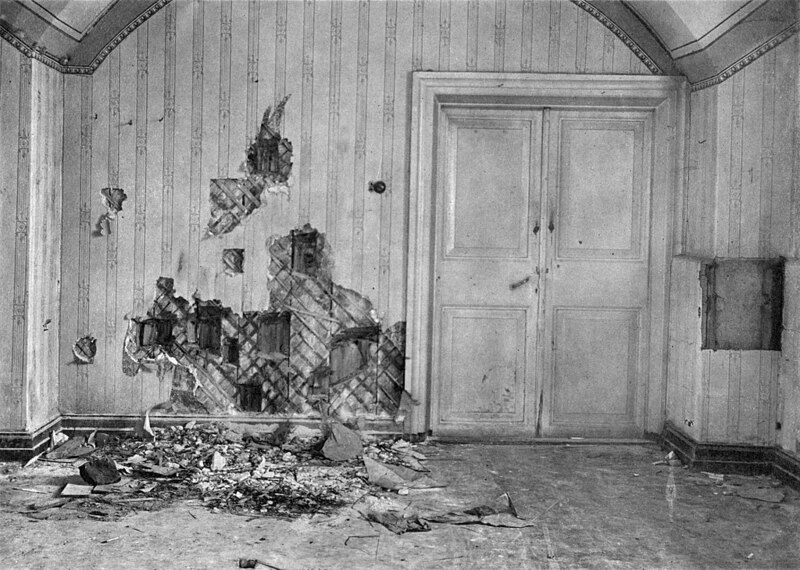 The murder of the Romanov family and their loyal retainers is so messy that yeah, you could almost believe that one of the children, wounded and injured but still breathing, could have crawled away undiscovered. Almost. I can even see how it's tempting to want one of the men involved that night to have a heart somewhere and smuggle a child away to safety. Yurovsky left three men to guard the mine and returned to Yekaterinburg with a bag full of looted diamonds. When he returned the next day at 4 am with more men, they brought up the bodies from the shallow mineshaft, intending to bring them to another, deeper disused mine. burial site was under those railroad ties. But the truck got stuck in the mud. Really stuck in the mud. They were near a place called Pig's Meadow. Dawn was approaching, everyone was tired, so Yurovsky decided to just bury the bodies under the road they were stuck in. 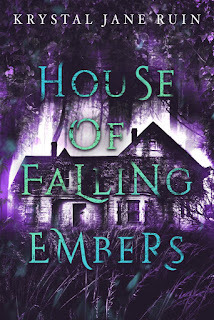 They dug a grave and the bodies were tossed in except for Alexei's body and one of his sisters. 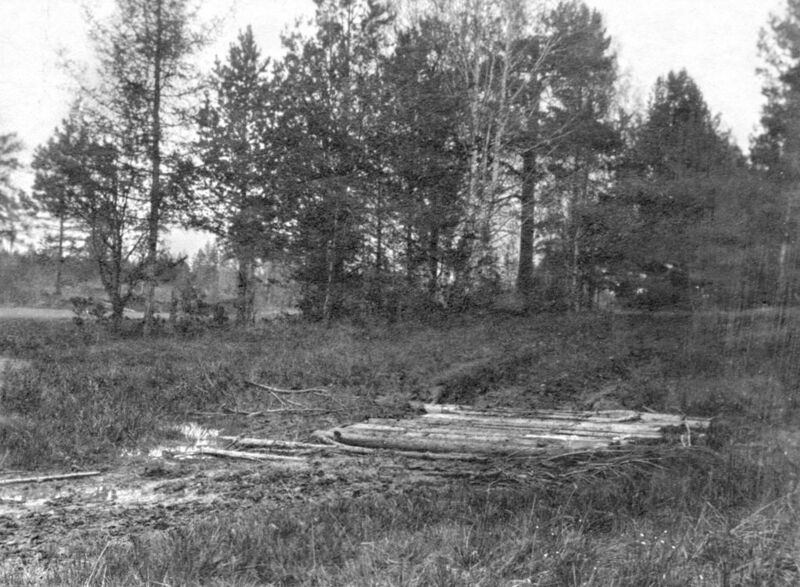 Once the grave was covered over, railroad ties were put on top of it to help move the truck and the truck drove over the railroad ties a few times to disguise the fresh grave. Then the men tried to cremate Alexei's body and that of one of his sisters. Their bodies--severely disfigured, burned, and covered in acid--were buried separately from the rest of the family. In the meantime, back at the Ipatiev House, the Romanovs' belongings were being rifled through. 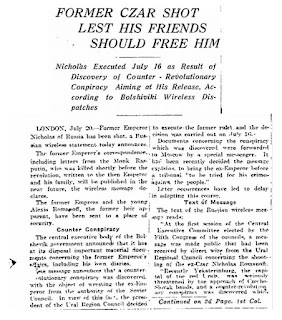 Within a few days, the Bolshevik government released the news that Nicholas II had been shot. They said "his wife and son have been moved to a secured place." A week after the Romanov family was murdered, Yekaterinburg was taken by the White Army. The White Army established an investigation, but it was terrible, so in 1919, they put a magistrate named Nikolai Sokolov in charge of the investigation. In the course of his investigation, Sokolov interviewed the surviving members of the Romanov entourage, including the childrens' tutors. He interviewed guards, soldiers, and locals. He went through the Ipatiev House, where the Reds had left a mess. apart by investigators in 1919, looking for bullets. Remember, the government only admitted that Nicholas was shot and killed. There were suspicions that the rest of the family had been killed as well. 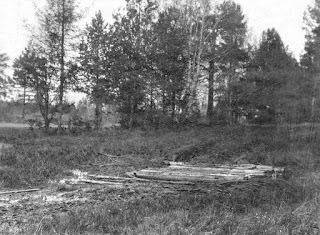 In the initial investigation just after the Whites took Yekaterinburg, investigators found the first mineshaft, where in their haste to bring up the bodies and rebury them, Yurovsky and his men left a lot of evidence lying around--bone fragments, Dr. Botkin's dentures and glasses, corset stays, belt buckles, shoes, pearls, diamonds, a few bullet casings, some odds and ends like old nails which the Tsarevich kept in his pockets, and a severed female finger. Sokolov also noted evidence of fire and containers which had contained sulphuric acid and concluded that the bodies had been cremated at the site. When the Red Army retook Yekaterinburg, Sokolov boxed up his evidence and reports and shipped them out of the country to France. Sokolov himself left Russia in 1920. 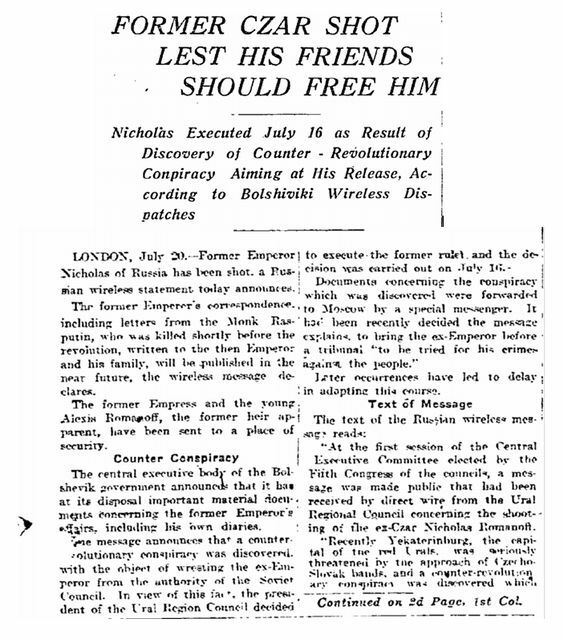 In 1924, the year he died, Sokolov compiled his investigation into a book, The Murder of the Imperial Family. His conclusions stood as the only semi-definitive answer to the mystery of the Romanov murders and burials for at least seventy years. But with no bodies or ashes or a definite grave found, rumors and imposters persisted--and the Soviets didn't confirm everyone's deaths until about eight years after. When George V of England received confirmation in autumn 1918 from his diplomats in Russia that the whole family had been killed, one of the first people he wrote to was his cousin Victoria, Marchioness of Milford Haven. The marchioness had been born Princess Victoria of Hesse and by Rhine--and she was Alexandra and Elizabeth's older sister. of Edinburgh. In the second row, from left to right: future tsar Nicholas, his fiancee Alix, Victoria Milford Haven, Ernest Louis. 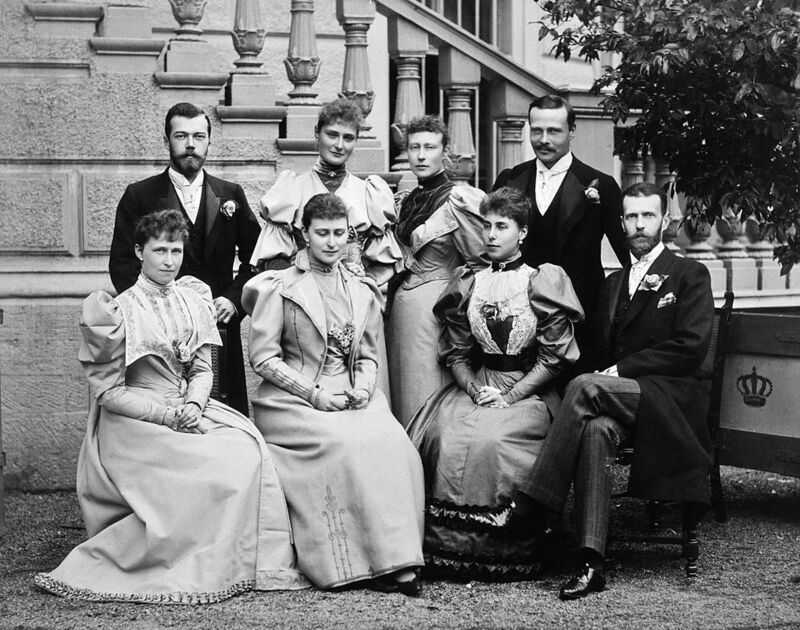 Front row, from left to right: Irene, Princess Heinrich of Prussia, another Hesse sister; Grand Duchess Elizabeth, later an Orthodox nun; Princess Victoria Melita of Edinburgh; and Grand Duke Sergei Alexandrovich, Nicholas's uncle and Elizabeth's husband. You can't imagine what her reaction must've been--in fact, when World War One broke out back in 1914, Victoria and her daughter had been on a visit to Russia. Victoria had tried to talk her sister Alexandra out of her devotion to Rasputin. Victoria and her daughter Louise were in Yekaterinburg when the war began--she'd seen the Ipatiev House--and they had had to race back to St. Petersburg so they could return to England quickly. So quickly that Victoria left a lot of her jewelry with Alexandra. At some point during the war and the Russian Revolution,Victoria wrote to George V about her Russian relatives that while she "understood that the boy is a political asset, surely the girls cannot be of value" and offered to take in her nieces in England, where Victoria and her husband lived. Extra tidbit: Victoria Milford Haven is Prince Philip, Duke of Edinburgh's grandmother. She helped raise him. Decades later, Prince Philip said he'd "love to visit Russia, except the bastards murdered half of my family." In the 1990s, when the main grave was located and the skeletons found, Prince Philip contributed DNA to be matched against Alexandra's and her daughters--because Prince Philip has the same mitochondrial DNA as Alexandra and her daughters, through his mother, grandmother, and great-grandmother. Okay, gang, now you get to choose. Do you want to read more about the Romanovs? B) No, my brain's exploding. C) Yeah, tell me about the other Romanovs, too. E) How did they find the graves? Do let me know in the comments, on Twitter, or Facebook! It seems odd that they didn't bury all of them together. Why carry the other two bodies further? (Or maybe I missed something...) This is fascinating! I mean, who really knows why, but it looks like they really wanted to cremate the bodies, but that's impossible to do out in the open. And I think they maybe wanted to try to make it harder for anyone who found the grave? That room gave me chills! And it's almost exactly like I had pictured it in my head. Of course the imposters would be interesting! My sister and I are going to see the show tomorrow night! I hope you enjoy the show! Let me know what you think! One vote for imposters. Got it.